Since registering for the WTA HIke-a-Thon, I have decided to "compete" (I put that in quotes because I am so not a serious competitor in this realm) in the "Most Lakes Visited" category. For my purposes, I may as well be competing in the "most lakes swam in (swum?)" because, for me, that's really the true purpose of a mountain lake – cool off, float and refresh. I was pressed for time on Saturday, with a week of final exams upon me, so I opted for a short hike to Mirror Lake from a trailhead where you drive most of the elevation gain, leaving yourself with only 650 feet of gain in 1.5 miles. I grabbed a friend and we set out on the trail. It was a pretty nice trail except for the paper plates that were either hung from tree branches or nailed (!) into the tree trunk. 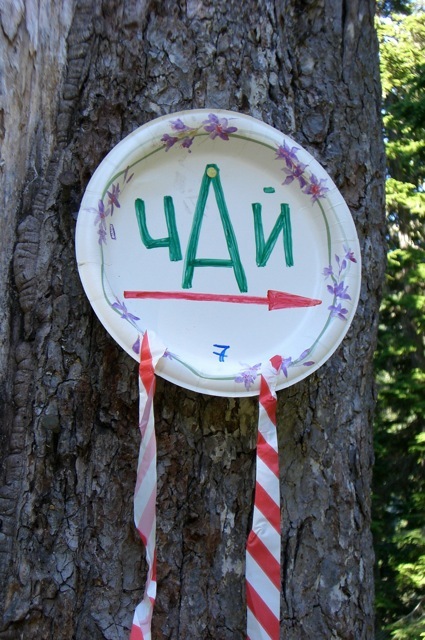 These were directional arrows for some cryptically-named party who were apparently arriving in separate groups. It lent a white-trash ambience to an otherwise middle-of-the-road trail. Luckily, the signs eventually pointed away from the lake so we wouldn't be running into the miscreants. 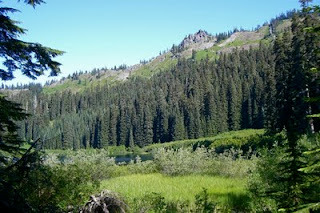 At the lake, we were happy to see a couple of families camped, with sociable children giddily running about, thrilled to have spent a night out in the wilderness. It was a welcome change from the typical camped-out family where the children look like they are at a forced-work camp, they are deep in video game withdrawal and they have reverted to throwing rocks into the lake. These kids were definitely future mountaineers and stewards of wild lands (let's hope so). Hats off to the parents! 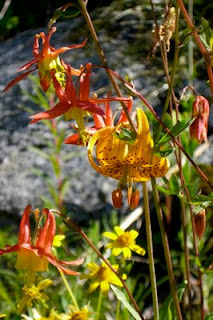 Just past Mirror Lake, the trail crossed the outlet and descended to a lovely flower-studded mountainside. We spotted Columbine, Tiger Lily, Larkspur and Lupine and those were just the ones we knew the names of. With the sun out in full strength, we headed back to the lake and found a nice point of entry. This being my first mountain lake swim of the year, I was a little apprehensive at the temperature of the water... would I really be able to swim? I got in, breathed shallowly, sticking close along the shoreline. Yes, now I remember how this is done. I pulled myself out on a rock, warmed a bit and got back in. Much better, except my hands were going numb. My friend managed to untangle my camera from my pack and take a photo before my hands completely checked out. I got out, bundled up in my down jacket and felt the blissful feeling of summer come over me. There's still time to donate to my Hike-a-Thon efforts for the WTA; link is here. Thanks!